The British Cupping Society (BCS) is lead by a team of medical professionals aiming to professionalise Cupping Therapy. This is achieved by educating and training medical and healthcare professionals using evidence based protocols. The BCS guidelines have been accepted as the ‘benchmark’ in clinical standards by Ministries of Health, universities and peer reviewed science journals. Wet cupping creates a mild suction by leaving a cup in place for about 3 minutes. The therapist then removes the cup and uses a small scalpel to make light, tiny cuts on your skin. Next, he or she does a second suction to draw out a small quantity of blood. Afterwards, you may get an antibiotic ointment and bandage to prevent infection. Your skin should look normal again within 10 days. 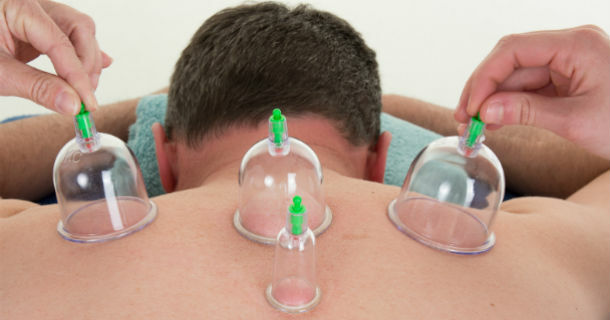 John Rothery one of the Osteopaths at Rothery Health is a Medical Cupping practitioner and has trained under the BCS to perform this therapy.Click on the video link to see a demonstration of wet cupping. Call us now on 01834 813975 for a consultation! © Rothery Health Clinic 2016. All Rights Reserved.